It’s a perennial irony, one cited as a matter of course by animal rights people, that, to paraphrase Melanie Joy, we love dogs but eat pigs. This irony not only reflects a glaring case of selective moral consideration—we spend billions a year to pamper canines and just about that much to kill and eat swine–but it also, less obviously, represents a huge if unacknowledged fissure in the foundation of human civilization. How can any society hope to become more just and compassionate when it’s built on a bedrock of hidden and avoidable violence? It’s perfectly natural and understandable for ethical vegans—those who have internalized the inequity of this irony—to condemn the meat-eating masses for loving dogs and eating pigs. It’s so obvious, we think. Why can’t people simply open their eyes and recognize the injustice that’s right in front of us? Wake up! It’s our collective failure to do so that leads so many vegan activists, I would venture, to become nihilistic ranters about the fall of humanity. Two recent books, if read the right way, help illuminate the core of this irony as well as the complaisance with which we accept it. John Homan’s What’s a Dog For: The Surprising History, Science, Philosophy, and Politics of Man’s Best Friend and Jill Abramson’s The Puppy Diaries: Raising a Dog Named Scout remind us in varying ways (sometimes unintentionally) of a critical point that bears directly on our contemporary speciesist behavior. More than anything else, these books drive home the important reminder that ideologies—including ideologies of oppression—have their roots in material realities. When those roots and realities run 130,000 years into the past, as does the human relationship with dogs, they can, to say the least, be tenacious enough to prevent rational thought and moral consistency in the present. Our failure to treat species with equal moral consideration derives as much, if not more, from past behavior than present-day realities. Several aspects of the human-canine relationship—aspects that are unique to dogs and dogs alone—help explain why Westerners in particular won’t eat them. Heaping irony upon irony, the first aspect is that dogs, more than any other species, have elicited from humans a habit of compassion possibly more intense than that evoked by our fellow humans. As Sue Halpern recently pointed out in an excellent New York Review of Books essay, neoteny—the retention of cute baby-like features into adulthood—has enabled dogs in particular to trigger “ human’s innate caretaking impulse.” In eliciting love from our hearts, dogs have taught us to spare them while slaughtering other species that are just as capable of suffering. Smart animals. A second aspect of the human-dog relationship forged in the crucible of time is the unique ability of dogs’ to reflect and embody human aspirations. A well-trained and well-bred dog could serve powerful aspirational functions in any status-driven culture. In this respect, as Homan’s writes (and Halpern quotes), “Dogs in the Victorian Age . . . were stand ins for humans, replicating their master’s inner excellence and class pride.” Pigs, for a wide range of reasons, didn’t accomplish this goal quite as effectively. A third factor among many others is that dogs have proven to be, again in the words of Homans, “instantly customizable.” The physiological range of today’s canine, in addition to the species’ relative docility and neoteny, has thus appealed to the inherent human desire to shape the world around him. One should never underestimate the intoxicating nature of this power. Humans have essentially stretched the grey wolf into a spectrum ranging from the dachshund to the Doberman and, in so doing have with god-like arrogance invested each breed with specific functions and meanings. Because dogs have so dutifully fulfilled those functions and meanings, all the while looking terribly cute, dominant human cultures have kept them off our plates. None of these historical factors are in any way meant to downplay the horrors that flow from our contemporary carnistsic hypocrisies. 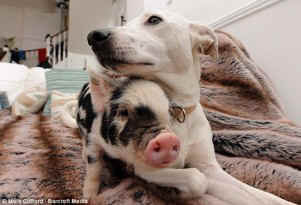 We are right to hammer away at the contradiction of eating pigs while loving dogs. It’s just to acknowledge what I am coming realize vegan activists too often overlook: the power of the past. It’s a power that’s as genuine as it is distorting, invisible as it is conspicuous, and, however unintentionally, intent on excusing our daily refusal to be better people than we are. Should you downplay this power I would draw you attention to the scene in Abramson’s book—a book attentive to the issues raised here–when, to spoil her dog, she cooks him a piece of chicken.